In this post I will describe the setup I will follow to start using Anki, hopefully as a daily routine. The motivation for this was reading this detailed post from Michael Nielsen on my Twitter timeline. Two years ago I decided to start learning a new random language from zero, I picked Japanese and in six months approximately got the certificate for the first level of the Japanese Language Proficency Test, without attending to any class or paying any significant amount of money, which seemed impossible to everyone around me. This was probably thanks to a decision I made when I started studying, I would make use of any kind of web/app/video I could get, and I would carry them all day long on my phone, if during my day I had nothing to do I would start doing exercises and flashcards, there was no big gaps of boredom in my daily routine, but it seemed to be a lot of small periods of time like going to work were I could study. The premise for Anki seems pretty similar to those kanji memorization apps I used, but not so specific. So It was easy for me to convince myself for trying it. There are several ways for getting Anki running, but if I want not to pay for it, self-host it and carry it on my phone I definitely going to need anki-sync-server. Following the install from sources was not that straightforward, I also had to look at this issue and this other issue for getting it running. I tried installed the desktop client on my PC using pacman but then this bug happened. Since I will be using mostly the Android client I uninstalled the desktop package and didn't waste any more time. I downloaded this Android client and pointed it to my home server. Finally I made some Nginx configuration magic in order to communicate using HTTPS with my home en sever and... Jackpot! 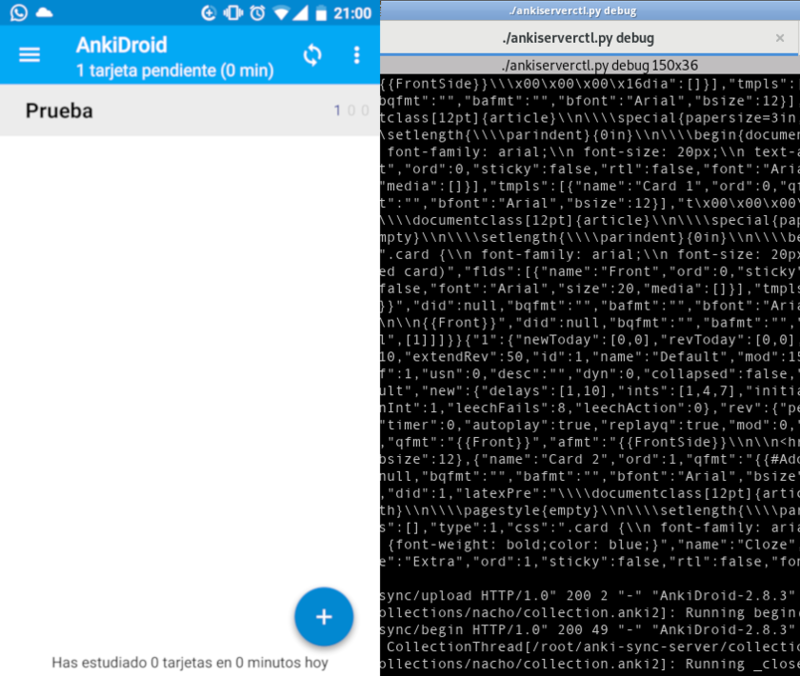 And that's how I did to get Anki selfhosted working on my phone, now I just need to build the habit!